A common homeowner's dilemma is the metal shed in the back yard. It is a practical, utilitarian structure that allows you to store all the garden tools, the lawn mower and perhaps a bicycle or two. Unfortunately, a basic metal shed is just plain ugly. An industrious homeowner, however, can transform that ugly blotch in the landscape into a decorative element in the garden in just one weekend. With the addition of paint, planters, trellises, plants and decorative elements such as faux windows, new doors and solar lights, an ugly metal shed becomes a statement of garden decor ingenuity. 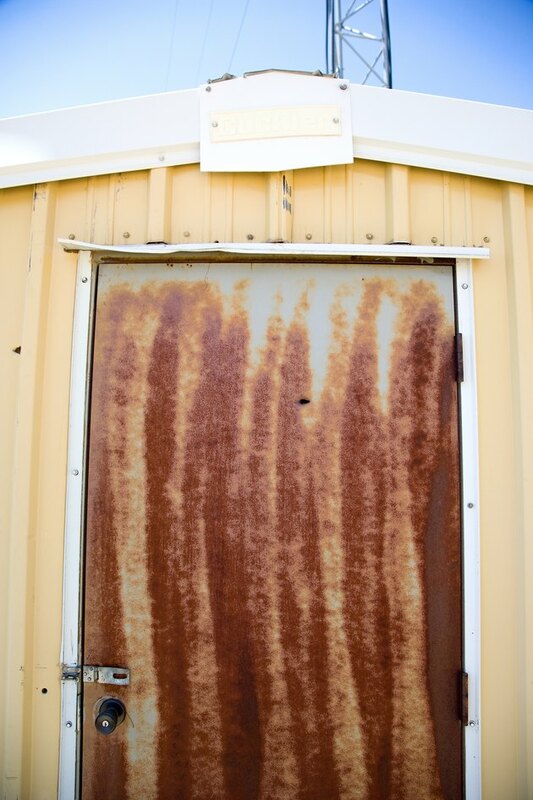 This rusty metal shed has seen better days. Clean the exterior of the shed with TSP, water and a scrub brush according to the TSP manufacturer's instructions. Rinse thoroughly. Paint the shed so it blends into your yard. Wire brush, sand and and prime any rusted or peeling areas. Roll two coats of your selected color onto the shed according to the manufacturer's directions. Allow each coat to dry completely. Change the metal doors. Build a simple frame of 2-by-4 boards to fit inside the door opening, bolting it to the shed frame. Cut down two recycled doors to fit and attach them to the frame with hinges. Install exterior doorknobs. Prime and paint the doors in a color that contrasts with the shed. For example, if the shed is forest green, paint the doors in a creamy white or light yellow. Install small, decorative windows on the shed. Place the windows flanking the door or on the sides of the shed that are visible from the house. Paint the window frames to match the shed doors. Spray paint the inside of the glass a light sky blue, add a decorative window film or glue mirrors behind the glass. Predrill holes through the window frame and into the shed wall. Attach with bolts and nuts. Add a lightweight fascia, or trim, of 1-by-4 boards around the edges of the roof. Measure and cut to fit. Use construction glue and screws to attach the trim to the edge of the metal borders on the roof. Prime and paint with the trim color. Place large flower pots or planters in front of the shed, flanking the doors. Fill with tall perennials, shrubs or small trees to hide the shed's humble origins. Install two trellises, one on each side of the shed. Plant quick-growing vines such as morning glories, nasturtiums or green beans to cover the trellises and clamber over the shed roof. Add decorative elements such as a wind vane to the peak of the shed, solar twinkle lights around the roof line and a horseshoe for good luck over the door. Also add shepherd's hooks to the garden surrounding the shed for hummingbird feeders, wind chimes, hanging plants and solar lights. Build a path to the shed, winding through the garden. Line the path with annuals, perennials and bulbs such as cosmos, hardy hibiscus, daffodils and iris.